As I in november 2011 retired our 2003 vintage Apple PowerBook G4 running OS X 10.3 (Panther) for an Apple MacBook Air, this triggered a rewrite of the previous document to account for configuration of Apache under OS X 10.7 (Lion). 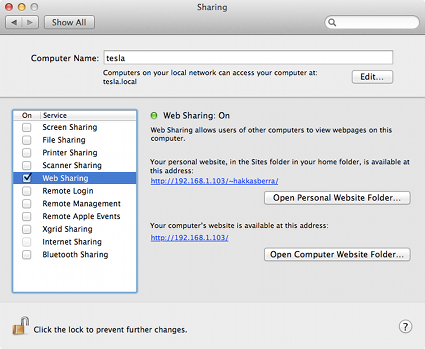 Though still straightforward, a few things have changed over the years, in particular the location of the configuration files. Save the httpd.conf file (in Emacs by Ctrl-x Ctrl-s) and kill the editor (in Emacs by Ctrl-x Ctrl-c). 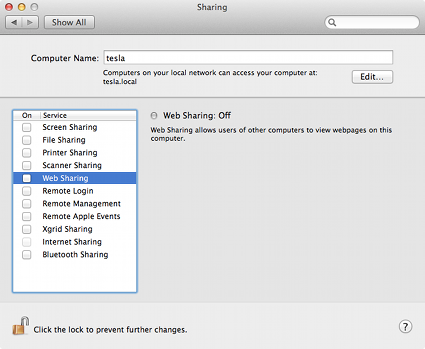 Restart the Apache server: Start System Preferences -> Sharing -> Services -> Personal Web Sharing, followed by checking the Web Sharing checkbox.